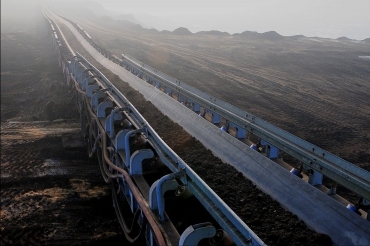 Conveyor belts with steel cords and with special rubber covers are used for the transport of loose materials at elevated temperatures of up to +150°C and can operate in ambient temperatures from -40°C to +60°C. These belts are used to transport hot materials such as: sintering, slag, molding, limestone, cement clinker, coke, and fertilizers. The belts are made up of a core of longitudinally arranged hot-galvanized steel cords vulcanized in a special core rubber, and with rubber covers. Due to the properties of their steel-rubber core, ST type belts are recommended for long and sloping routes where extremely low elongation, long life, and a high degree of reliability are required.